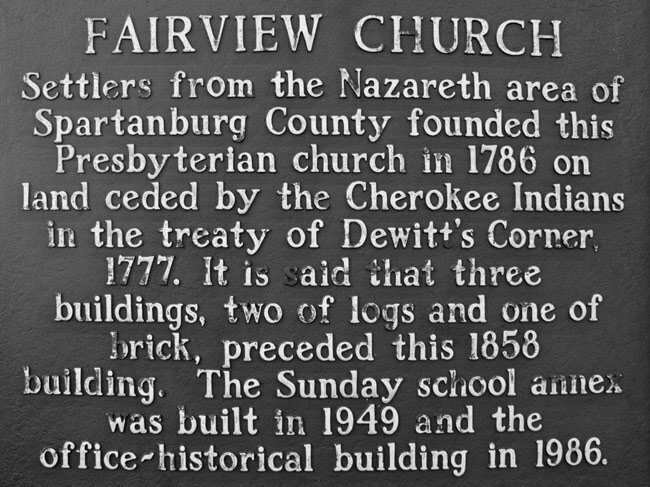 Fairview Presbyterian Church in Fountain Inn was founded in 1786 by Scots-Irish Presbyterians from County Antrim, Ireland, who arrived here by way of Nazareth Presbyterian in Spartanburg County. The founders, who immigrated in 1773, named their church in honor of their Irish home church. 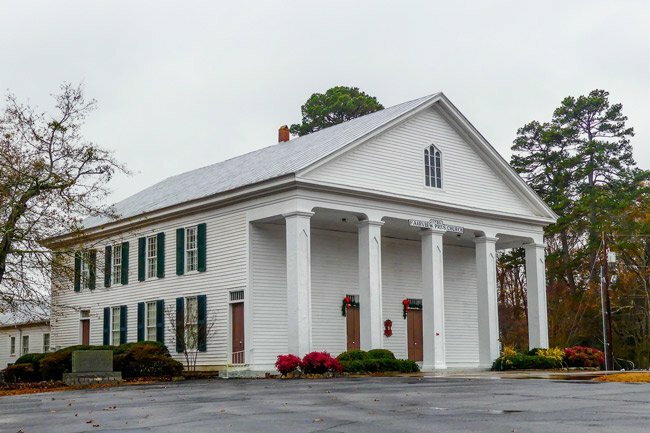 The congregation is considered the “mother of Presbyterianism in Greenville County” and is thought to be one of the Upstate’s oldest church bodies and the oldest Presbyterian church in the county. 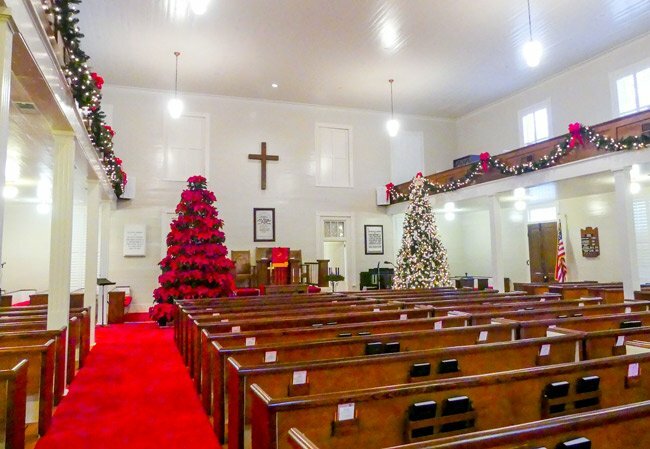 The church was founded on land in present-day Greenville County that was ceded by native Cherokees to European settlers as part of the DeWitt’s Corner Treaty of 1777, which ended the Cherokee War. Three brothers – John, Samuel, and David Peden – received grants from the former Cherokee land as payments for their service in the Revolutionary War. Together with their nephew, James Alexander, and another man, James Nesbit, they built a log structure on the land to house a new church. The current clapboard church, shown here, was constructed in 1858 and is the fourth edifice to house this congregation. The second sanctuary was also a log building, while the third was built of brick in 1818. The churchyard at Fairview Presbyterian also bears historic significance. 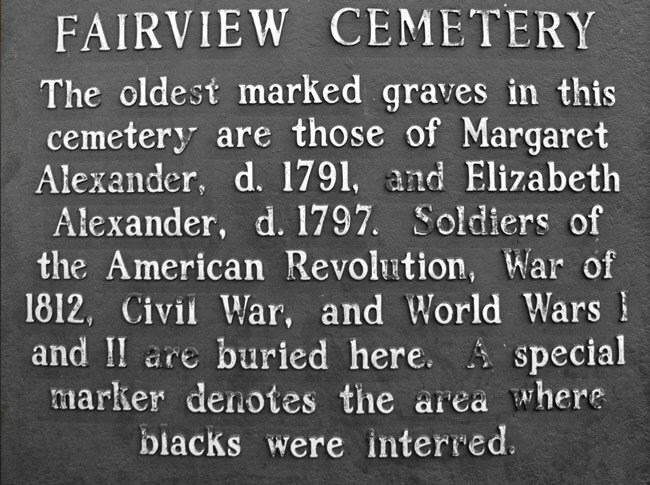 Graves date to 1797, and veterans from the Revolutionary War and the Civil War are interred at Fairview as well as several slaves who attended church here prior to Emancipation. Fairview Presbyterian Church belongs to the Presbyterian Church of America (PCA) denomination. The church deeply values the Presbyterian tradition and routinely engages in historic practices during worship. 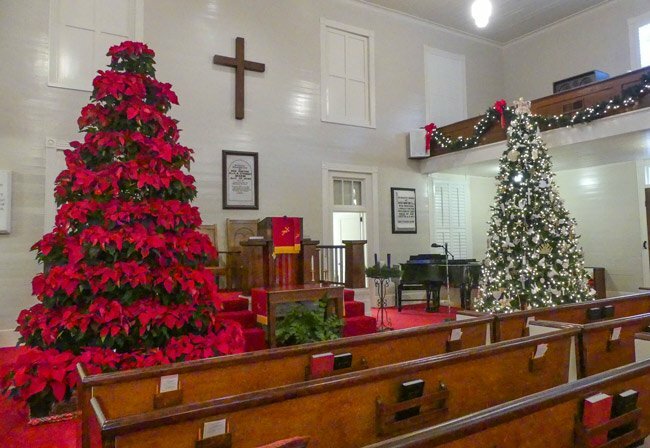 Organized in 1786, Fairview Presbyterian Church is one of the oldest churches in the South Carolina upcountry. Fairview Presbyterian Church was constructed in 1858 and is a white clapboard, two-story structure and is virtually original. 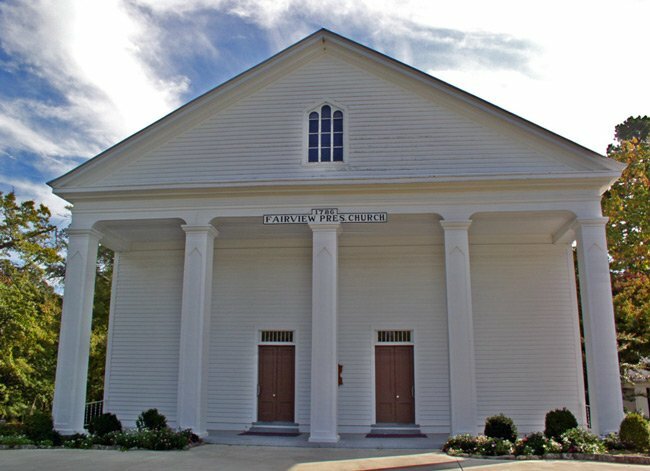 The church exemplifies the Greek Revival style with its clapboard siding, square columns, and pedimented portico. Other features of the building, such as the twin entrances under the portico and the side doors which lead to the gallery, are also indicative of the meeting house style which frequently influenced rural churches. Original interior features still in use are the pulpit and pews, their feather graining intact. Although a one-story section was added to the rear in 1949 the building’s architectural integrity has been retained. There have been four church buildings on the present site. According to church records, the third church was brick and was dedicated on August 11, 1818. This church was replaced by the present frame structure. 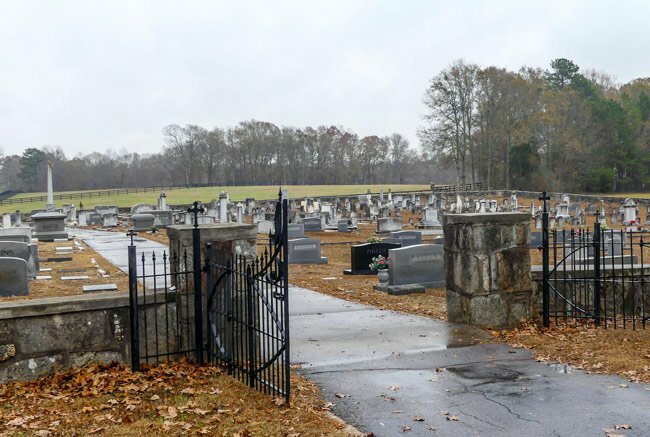 Fairview’s cemetery is significant in its own right, the oldest graves dating from 1797. There are graves of seven Revolutionary War soldiers, plus those of soldiers in later wars, as well as those of slaves. A fieldstone wall surrounds the cemetery.